Don’t look now, but California has gone back to a dry pattern. Major storms there in December made the news, and some people I know were talking as if the drought there was broken. Not so fast. One of the heartbreaking things about droughts is that they offer you hope, then take it back away. It rained in Oklahoma during the Dust Bowl, but every time it was not enough, and every time the drought returned full force. During January, the drought returned in California. NOAA data isn’t yet available for the whole state as a single aggregate. In the chart at right are precipitation totals for six California cities that span the state from Redding in the far north to San Diego in the far south. The blue bars represent normal precipitation for January, the red bars actual precipitation during January 2015. The whole state has been dry, and in the north, where they get most of their precipitation, it basically didn’t rain at all. In California, the snowpack is all important, for it releases its moisture slowly as it melts, providing water during the hot, dry summer. The most recent snowpack survey was conducted 1/29/2015 by the California Water Department. The water content of the snowpack was just 25% of the historical average for this date. It is unclear at this time exactly how the drought will affect Missouri. One possible effect would be increased food prices. As I have previously noted, California produces roughly half of the nation’s fruits and vegetables. 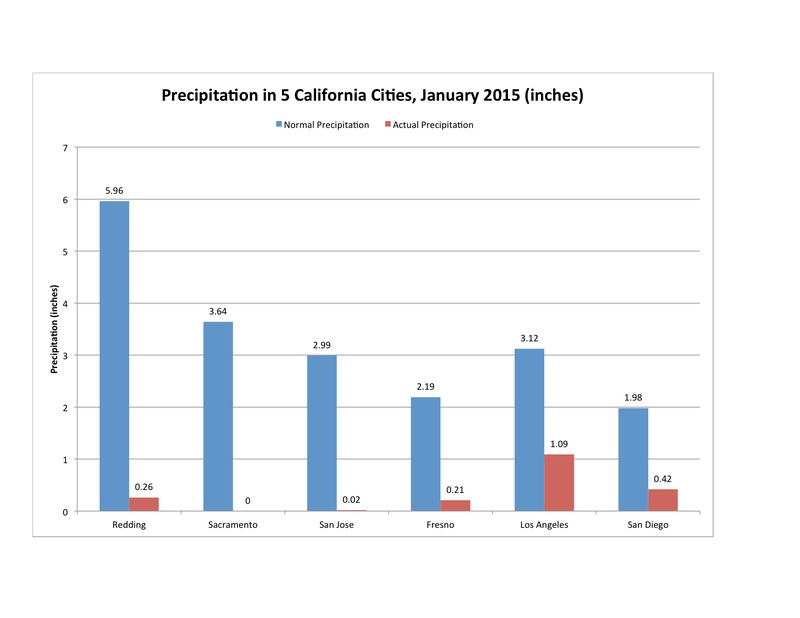 Precipitation data for 6 California cities were found on the National Weather Service Forecast Office for each city. On the home webpage for each forecast office, in the left column select “Climate – Local.” On the resulting page, select the Daily Climate Report for the desired location for January, 31, 2015. For the California snowpack data: “Scant Precipitation, Little Precipitation, Produce Weak Snowpack”. 1/29/2015. California Department of Water Resources. http://www.water.ca.gov/news/newsreleases/2015/012915snowpack.pdf. By mogreenstats in Climate Change, Weather Patterns on 2015/02/05 .